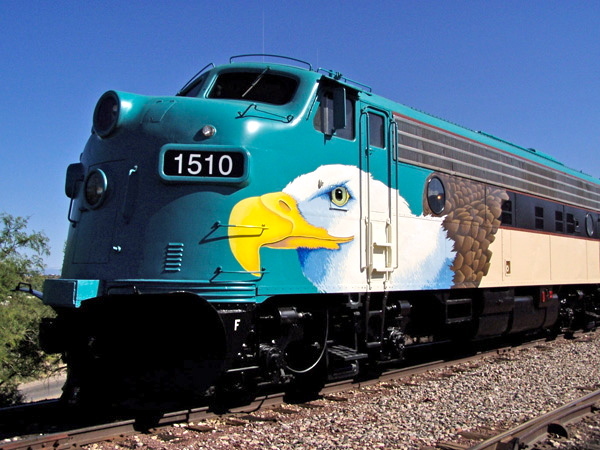 American Flyer® S Gauge electric trains were made from 1946 to 1966 by the A.C. Gilbert Company in New Haven, Connecticut. These toy trains were known as tinplate from the days before plastics. The American Flyer® line of toy trains reached their market peak in the late 1950s. This was the time when the most colorful and most sought-after American Flyer® items came into production. These "3/16 scale" trains had a much more realistic appearance than other O gauge trains produced by Gilbert’s competitors. By the early 1960s, however, electric toy trains began to decline in popularity, mirroring fundamental changes in the toy industry thru out the country. 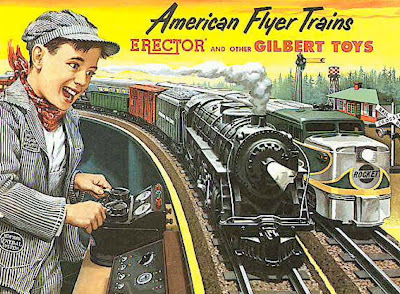 Gilbert eventually ceased train production in 1966 and declared bankruptcy the following year.Lionel® bought out American Flyer® American Flyer® toy train line. I will be building this photo gallery to show the significant realism of American Flyer® S-gauge electric trains running on two-rail track, and using AF rubber roadbed, with Railsound 5.0 in the UP Northern. While I'm building my Arizona Desert to Mountain layout. I will try to provide practical tips for constructing my S scale layout. I will do a step-by-step photo gallery that will show my modeling techniques. A model railroad consists more than just track, scenery, building and trains. Things like benchwork, operating system, and location are just as important. American Flyer® S gauge trains "sometimes called S scale" is modeling in "3/16 " to the foot or a proportion of 1:64 to the real full size model. In other words, the real model is 1:1 and 64 times larger than S gauge models. Today many American Flyer® “S Gaugers” still operate their old realistic trains that where stored away in attics and passed down from generation to generation. Infact many “S Gaugers” today started out as a young boy with a dream of a American Flyer® train with "choo-choo" and smoke, that just happen to appear under the tree on Christmas day morning. From those early days “S Gaugers” became a diverse lot. Some of us are hi-railers, some tinplaters and others scale modelers. All of us operate and collect American Flyer® S gauge trains. You will find some hi-railers whose models are even more highly detailed than the scale modelers. We will become the next generation of “S Gaugers” Come join use in the "Valley of the Sun" S-Gaugers Club where followers can become members. Most recently more manufacturers have produced a wide array of S products, including Lionel, Show Case Lines & American Models. Our club does except donations of model trains and accessories. We are always happy to restore old trains, to give them new life for years to come. We have over 25 members in our club, "Valley of the Sun S-Gaugers" that help with this program of finding young boys and girls that would like to enjoy the "Wonderful World of Model Trains".